Order Beaverdale Vieux Chateau du Roi 6 bottle from the Stirling Homebrew Shop UK. 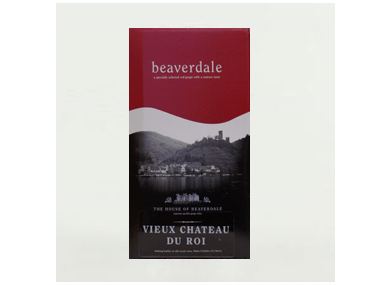 Buy Beaverdale Vieux Chateau du Roi - 6 bottle and other Wine Kits safely online in the UK. House of Beaverdale is a pure grape concentrate of such high quality that it allows people to produce fine wines in their own homes. Red Wine kit. Where to buy Beaverdale Vieux Chateau du Roi 6 bottle safely online? Shop at the Stirling Homebrew Shop if you are wondering where you can buy Beaverdale Vieux Chateau du Roi - 6 bottle safely online in the United Kingdom. Vieux Chateau du Roi 6 bottle - Beaverdale Vieux Chateau du Roi - 6 bottle in Wine Kits and Homebrew.